I breathed deeply and stepped towards the centre of the ring. It was one of my earliest fights in England and my opponent was a popular local girl with vociferous support. I had trained hard for the bout. However, I lacked experience and had watched relatively few Muay Thai fights in person, relying instead on fight videos for inspiration. My opponent immediately started punching wildly—throwing big looping hooks. Hold on—this isn’t what happens in the videos! One problem with studying videos of professional fighters is it can leave you with unrealistic expectations of how your own fight will progress. In the bouts I had watched, especially those in Thailand, the boxers would start slowly—tentatively feeling each other out in the first round. I was foolishly unprepared for my opponent’s immediate onslaught—my guard low and insufficient. One of those big hooks connected with my left temple. And then the fight was over. It was less than a minute into the bout—probably even less than 30 seconds. I had—in boxing jargon—been “caught cold”. My memories of the event are patchy. I don’t recall experiencing any pain. I do remember my visual field gradually narrowing to darkness and the roar of the crowd petering out to silence. My next recollection is being in the changing rooms asking my trainer what happened. To this day I have no memory of the fight ending, congratulating my opponent, bowing and leaving the ring, and making my way backstage. 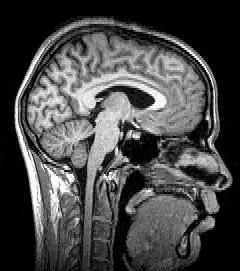 Brain MRI. Image source: Wikipedia. During the time I was training for that fight, my “day job” was studying for a PhD in Neuroscience (the study of the brain) at Newcastle University. Given my academic background, one question I am often asked is whether the risk of damage to the brain caused by blows to the head has ever caused me concern. Before I address Muay Thai’s possible detrimental effects, I’ll start by discussing its positive effects. Often likened to a game of chess (with violence), Muay Thai involves complex strategies for attack, defence and counter, and a range of techniques. Therefore, to train in Muay Thai is mentally as well as physically stimulating. When a person learns a new skill, this encourages the generation of new nerve connections in the brain. During repeated practice, such as training drills, these connections are strengthened. The brain also has a regulatory process in which unused nerve cells are eliminated; so any activity that stimulates and encourages learning is beneficial to brain cell maintenance and function. The phrase “use it or lose it” is one that applies to the brain as much as to the muscles. According to research, vigorous exercise promotes the growth and survival of cells in an area of the brain involved in learning and memory. Increased blood flow during exercise has further beneficial effects of promoting the transport of oxygen and nutrients to brain cells. But what happens to these brain cells after a punch to the head? A boxer can be on the receiving end of different grades of blows. A knockout (KO) blow to the head is a fight-finishing strike—often associated with loss of consciousness caused by trauma following the sharp rotation of the skull. Memory loss and concussion are other adverse effects. Strikes to the head can be concussive without causing a KO and these are more difficult to recognize—symptoms of headache, confusion, memory loss, or dizziness might not appear until several hours after a bout. Repeated subconcussive blows—which can be sustained within a fight or during sparring—can also cause changes within the brain and loss of cells. According to the regulations, after a KO loss, a boxer should be restricted from competing for at least 30 days. From what I have observed in Thailand, this rule is not strictly enforced, especially in the provinces. Financial considerations tend to take precedence over safety considerations—fighters may have families to feed or gyms have overheads to be paid. About 5 years ago, I spent time training in Chiang Mai and remember one teenage boy there fighting 4 times within a 10-day period, losing by KO on 2 occasions. After one of those KOs, he was back in the ring only 2 days later, going on to win the ensuing bout. While I admired his tenacity, I did wonder what level of damage might have been inflicted on his adolescent brain. 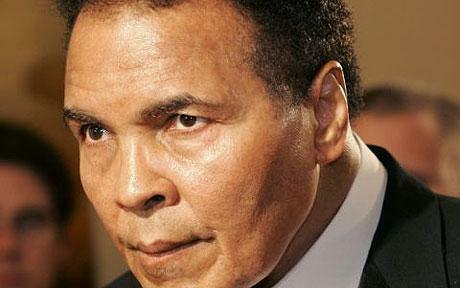 Muhammad Ali’s Parkinson’s disease is thought to have been caused by his boxing career. Image source: http://www.telegraph.co.uk. The long-term effects of Muay Thai on the brain are unclear. Research is lacking—certainly in English language—on former Muay Thai fighters and permanent damage that might have resulted from head trauma sustained during fights. Most existing studies on the subject were conducted on international rules boxers. Dementia pugilistica or “punch drunk syndrome” is a form of dementia associated with boxing, and characterized by loss of memory and concentration, problems with coordination, and depression. Although Parkinson’s disease, mainly associated with tremor and movement disorder, has a range of proposed triggers, it has been famously linked to head trauma in boxing legends Muhammad Ali and Freddie Roach. Both dementia pugilistica and Parkinson’s disease can be difficult to diagnose, especially in their early stages. Without suggesting that all former Thai boxers are prone to alcoholism or substance abuse, rumours abound concerning ex-fighters and whisky and “yaa baa” (methamphetamine) habits, and therefore the distinguishing of changes in mental, physical, or psychiatric function deriving from Muay Thai-related head injuries from those caused by alcohol or substance abuse would be extremely problematic. Losing a few brain cells sparring in Chiang Mai. Photo by Richard Crampton. The medical community has different views on whether the wearing of a head guard actually offers any protection against head trauma. Some scientists have suggested that amateur boxing is safer than professional boxing because of the wearing of protective headgear and lower rate of KOs. Others have speculated that the head guard only protects against cuts and facial swellings and does not prevent brain trauma. Research findings have also suggested that it is the repeated subconcussive blows—not the KO blows—that cause most damage to brain health. One study evaluated 42 professional boxers using tests of attention, concentration, and memory. Poor performance in these tests was associated with the number of rounds of sparring a boxer had completed (when they were wearing head guards), and not with age, fight record, or history of KO. After more than 11 years in the sport and 40+ fights, it is clear that I have not been deterred from training Muay Thai, despite its risks. Even after the KO loss, my feelings were of embarrassment and disappointment in myself rather than any particular concern for my health. Risk of head injury is associated with many other sports (including cycling, football and rugby) and several daily life activities. In Thailand, riding a motorbike without a helmet carries a far greater potential risk to health than fighting Muay Thai. Those who are concerned about head trauma should not be put off from the sport. It is quite possible to train without head contact and receive the same health benefits. Fighting is another matter but perhaps the risk is part of what makes it so exciting? I am interested in hearing your views on the subject. Have you ever worried about damaging your brain through Muay Thai? How many of you have been knocked out during a fight and what are your memories of the experience? What are your views on wearing protective headgear—should it be made compulsory or do you feel it would “water down” a fight and makes it less interesting? It will take years of research before we can have clear answers on the effects of Muay Thai on the brain. For now, I’m not worried. When I consider the positive effects Muay Thai has had on my life—physical fitness, challenges and achievements, unique experiences, and a great deal of pleasure—these far outweigh any potential risks in my opinion. I find that when I wear head gear sparring, people automatically think that gives them permission to go 110%… I end up getting hit much more forcefully then if I didn’t wear protection! Another thing worth mentioning is that Muay Thai blows tend to be spread across the body as a whole rather than predominantly targeting the head. This is true, I should have mentioned that. Thanks! Great article! I’ve never been knocked out but there were a few times I’ve been rocked and couldn’t see for a round or two. I think wearing head gear as a professional (or even most amateur fights) would definitely take away from the sport. However if you’re just beginning and want to step into the ring before risking it all then head gear and shin guards isn’t the worst idea. Either way I agree that the positives of muay thai definitely out weigh the negatives! I agree head guards would definitely take away from the sport for non-beginners. I don’t personally enjoy watching amateur Muay Thai fights nearly as much as professional bouts. The amateur boxing at the Olympics was still highly entertaining though…. What a fantastic read this was! Can’t wait for the next one! really enjoyed reading this, our health should be our main concern but we take that risk for the enjoyment of the sport and the buzz from training to progress and to win fights in the ring. with boxing i feel you are more at risk, in a fight and training you would take at least 60-70 % more shots to the head, but then u think strikes like elbows and knees could do a lot more damage then a punch. its a dangerous sport any contact sport is, what i am saying is them risks are there we take them regardless of how it may affect our health, we love the sport that much. It would be interesting to know the comparative forces of an elbow and a punch to the head. I’m guessing the elbow could inflict greater force because if its rigidity and smaller area of contact, and a knee to the head even more. Couldn’t find any good information using a google search though! Thank you for your comment. really interesting article Melissa! It’s amazing that you have a Phd in Neuroscience! Although I was never knocked out during my Muay thai career by punches or elbows, I was recently hit by an elbow in a fight in a very dangerous spot, above my nose right in the middle of my eyes or eyebrows. For a few seconds I lost my eyesight. I had headaches afterwards and for a few days later and I had to travel by plane the next morning. People thought I had nothing and just cracked my nose. I found out later talking to my brother that that one of the most dangerous spots where you can hit someone in a street fight to defend yourself and it is so dangerous you might even kill someone. It should be interesting to see the difference between the potential damage of an elbow strike and a punch strike. Regarding a head guard I do also believe that when you wear one people tend to go harder or 100 percent and if anything it just blocks your vision making your moves and reaction slower. 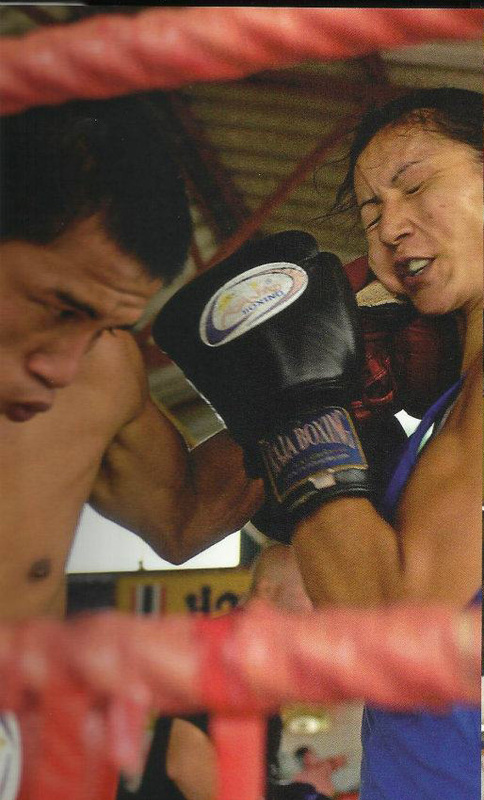 I do also recall the story of Adrienne, an American Amateur Muay thai fighter that died after an amateur fight in the States after receiving a few head punches in an Amateur fight, even though they said her injuries came more from heavy punches received before during sparring training. So I don’t think a head guard really protects against brain damage. I don’t see professional Muay thai with a head guard, it would make it another sport almost although I admit I really enjoyed watching a few Amateur World championship fights both at Ifma and WMF World championships. If Muay thai will ever be accepted in the Olympic games it will be with a head guard. But again the rewards and life experience you can have from Muay thai doesn’t compare to anything else so it worth the risk. Very interesting article, thank you. I am a professional Muay Thai boxer in the States, and I have been concussed in the sport. My last concussion was so severe that I had to take 3 weeks off my feet to recover. The funny thing is, I was never knocked out – I didn’t even fall down. I didn’t realize until the next day that something was wrong. Apparently, it’s not so much about one big hit as it is about the 2nd, 3rd and 10th big hits in a fight (or successive training sessions). From what I understand from the doctors I saw, concussions are like any other athletic injury, there is no way to tell when it might happen (the same way some people play long football careers relatively free from injury, while others tear their knee ligaments in high school practice), and so there isn’t really a way to protect against it. If you are sparring hard, headgear wont do a thing to save you from head injury, it’ll just obscure your vision. I think it’s one of those things where it is a dangerous sport, with tons of rewarding qualities, and you do it at your own risk. I always feel I get hit more in a head guard. It does obscure your vision, as you say, and therefore must slow reaction time. Or maybe people just let the shots go more when wearing head guards? I have only been knocked out once and my memory of the events is very sketchy. The initial blow knocked me down and my head whiplashed into the canvas. It hurt, but I got up and told the referee I was okay to continue. We set to again… and that’s the last thing I remember until someone was putting a sponge full of cold water over the back of my head and I was on my knees. The next thing I remember is after I had somehow got showered and dressed and was sitting in the bar nearby having an orange juice – with no idea how I got there from the ring. I still have no recollection of those two missing time periods. Haha, blissfully unaware of your own dementia?! 🙂 Just joking, I’m very impressed you’re still training (and sparring) 3 times a week at the age of 52. Excellent, clear, concise text in a truly accessible style. I would have expected no less. And you claimed that you were too far from your Doctorate to put it to use…… you underestimate your talents, which are many, and varied. Thank you for your kind comments, “Anonymous.” I am intrigued to know your identity! Clearly you know me personally…. I am the parent of a 21 yr old son who is going to be having his first tournament in Feb I am terrified you have slightly helped me understand a bit but in this case he has had 18 concussions 3 of them where a grade 3 level .. all from football 3 yr ago he was or is labeled as having a brain injury you would never know it though is in great physical shape but I am still having a hard time with this…his dr that knows him would not sign for him to fight but he will just go to a dif dr who will say he is ok not knowing his past … I am very scared and confused as have been working in health care for years knows what the affects can happen to him but him being an adult not sure what I can do family is split on what I should do one says he happy let him other says if you don’t do everything you can to stop this fight how will feel if he becomes worse it will tear me up. Not sure what I am asking maybe for just some comment to either calm me or encourage me to fight harder to stop this …. I can understand your concern – 18 does sound a high number of concussions to sustain. However, you should feel slightly reassured by the fact that your son suffered the injuries 3 years ago and no longer shows any symptoms. That would suggest he has fully recovered. I assume your son will be fighting in an amateur tournament and therefore wearing a head guard. A low rate of KO is associated with amateur fighting. Also, in Muay Thai the head is not the main target for strikes – kicks and knees are both scored more highly than punches. It is natural as a mother you will worry but, as you say, your son is an adult and can therefore make his own decisions on how he chooses to live his life. Risk is associated with so many sports and daily life activities – statistically higher than the risk associated with Muay Thai. And as I explained in my article, the benefits of Muay Thai far exceed the risks in my opinion. I think you should view your son’s passion for sports as a positive thing – better than him destroying his body with alcohol and drugs, for example. Thank you for taking the time to read and reply to my concerns I am going to take a few classes to try and see and I am going to try and support him the best that I can. Pleased to hear that, that’s great! You never know, you might become hooked on Muay Thai too! I have accepted this is what he wants to do but bow I might just lose him any way a trainier I talked to phone the owner of the gym my son goes to and the oner called me and said no he cant fight in his gym and wanted to know who is so now he wont be able to and now he is going to hate me. Oh gosh. Hopefully he will understand you only spoke to his trainer out of concern. So from what you are saying, Melissa, the kid has 2 choices in life; 1) Participate in a “blood sport” where the object is to beat another human into submission (hopefully by knocking them unconscious), or, 2) destroy his own body with alcohol and drugs!?? Hummm, So a lack of martial arts participation leads to a life of alcohol and drugs? (I had actually read that it was the other way around, at least for pros in Thailand.) Life options sure have narrowed somewhat from when I was a kid. Sorry, I don’t buy into the “great benefits” part of one-on-one combat. I’m sure there are immense physical, mental and spiritual health benefits from martial arts training, but the drive to actually use it on other people is a whole different matter. One last thought. I don’t think that a parent is going to gain any level of comfort from the knowledge that Muay Thai favors kicking and kneeing over punching! Most KOs that I have seen in pro fights are the result of kicks, knees and elbows to the head. Any person who has sustained 18 concussions by the age of 21 already has brain damage and HAS NO BUSINESS participating in a kicking, kneeing, and punching sport. I would do just about anything to stop him if it were my kid. I really feel for the mom. I fully understand your concerns, 18 concussions is quite something. I’ve been trying to understand the scoring in Muay Thai. I recently had my first amateur fight, where my opponent wouldn’t/couldn’t throw kicks at me because I kept interrupting her with teeps to the solar plexus, which pushed her back. In Round 1, the combo I used was teep + roundhouse to the ribs, which she couldn’t defend against. She did manage to catch a roundhouse but I used it as a chance to keep punching her. Oh and she also managed a do a take down in Round 1. During Round 2, she still didn’t do kicks. I got tired midway from all the kicking, so she took this opportunity to box me. I guess I panicked because I got cornered plus my headgear turned, completely blocking my vision. The ref did a standing knockdown count on me because I turned around (I know it’s dumb). I tried to “regain” points by kicking and clinching some more but I guess that didn’t work since, after the fight, she was declared winner by points. This kind of confused me because what I know is that kicks to the body and neck garner the most points. Did that standing knockdown cause all my points from my clean hits to be “cancelled”? I plan to fight again but I gotta understand how this thing works hahaha. Thanks! Well, because of the count that round would have been scored 10-8 to your opponent so you would have had to really have dominated to pull back the deficit. The scoring is complicated especially considering the differences between scoring in Thailand and the rest of the world and the differences between amateur and professional fights. Good luck for your next fight! Thank you very much for writing this. I ran across your piece in hopes of finding some encouragement because recently I suffered a minor concussion during a training session. My feelings are the same, super disappointment in myself because it wasn’t even a real fight. I’ve been training for a little over a year now and I’ve been picking up the pace in the last three months in hopes of doing a fight later this year. I’ve been hit a couple of times in the head, once really hard by a guy 3 times my size (I thought THAT was going to result in a concussion for sure!) but I lightly sparred w/ a person my size. Might I add that she has years of experience on me plus holds a title, but she was holding back, so what the heck?! Here’s the rundown of what happened, and maybe you can help me understand what precautions I should take? We were practicing combos, most with head kicks. Because I knew what was coming, I guarded my head as instructed. Her kicks are killer, even when she is holding back. I was rocked quite a bit, but nothing I’m not used to. Later that day, I started getting concussion symptoms (blurred vision in the left eye, increased pain in the right). Long story short, before heading to the hospital, I was in bed unable to even cry because any movement made my head feel like it was going to explode. My temple was swollen and I threw up. About 2 hours later, the doctor had me do a few neuro tests (squeeze fingers, follow the light, etc. ), but he wanted a CT Scan to be sure. Nothing was damaged, but I was prescribed some nausea medicine and ordered to lay off the Thai for 2 weeks. I feel like weak sauce because I train with my heart in it. To get a serious injury like that is not funny, it was horrible and scary, but I don’t know anyone else who experiences that JUST training. I want to fight, but my trainer (and my parents, of course!) are concerned. I’ve read that head trauma can be helped with the right mouth guard. I currently have one by Shock Doctor. Maybe I need to clench my jaw tighter? I’m definitely going to use head gear when I get back into training, though, just in case. Do you have any suggestions for head covers? I’ve been told to lower my chin while covering my temple with one hand and resisting impact with the other. Again, thanks for this piece. It really targets my specific situation and actually helps to understand the risks of the sport without the pessimism. I think you might be just scared, anxiety and stress cause those symptoms too. If you are training just for fun, just tell your partners not to hit you hard, just touch; after all you do it for fun. If you plan to be a fighter… you have to get used to hits. Yes, clench your jaw tighter and lower your chin. But don’t think too much about it, as a fighter you are going to be hit in the head at least once, that’s the risk you are willing to take when you decide to be a fighter. Melissa is right in the article, I know people who have suffered more than one concussion and they are not fighters… everything has risks, you only live once… you want to fight? You are going to get blows to your head. Make sure you maximize your deffense so that this doesn’t happen regularly. Don’t expect blows to your head because you are going to get them if you do… just train your reflexes, enjoy and go with the flow. Muhammad Ali developed Parkinson but also did his father and he was not a boxer. On the other hand, Jack Dempsey keeped his brightness until the moment of his death. Nobody knows what life has planned for us! The easy thing is to hit; what differences a great fighter from a good fighter, among other things, is the deffense. So train your reflexes to feel high kicks, and dodge them! Great response – don’t think I could have put it better! First let me apologise for the extremely delayed reply. My trainer and close friend died (after a stroke) and I had no heart for writing and haven’t logged onto this blog for several weeks. I can understand your concerns. It must have been terrifying to suffer such an acute injury after a seemingly minor strike. Unfortunately we have no way of knowing why one person’s body might react in one way to a situation or condition, whereas another person’s body might appear to have no effects. I think the key is to relax but it takes times to get over the psychological fears of reinjury after any type of serious injury. How are you doing now? Actually I’ve never worked as a Neuro nurse. My PhD was in Neuroscience so I have some knowledge of the brain though my thesis project was not on head trauma. I would never go so far as to say Muay Thai is completely safe! It undoubtedly has risks but my point was that risk is associated with many other sports (eg. dirt biking!) and daily life activities and I believe the benefits of Muay Thai far outweigh the risks. Thank you very much for your comment and good luck with your MMA training/fighting. Quality content is the main to interest the viewers to pay a quick visit the site, that’s what this web page is providing. You are just amazing! I was searching on the internet some information about brain injury in sportsmen population and I have have the pleasure to found your blog. Do you know what is the morbidity or mortality of Muay Thai fighters after a Traumatic Brain Injury? Is there epidemiologic studies on Thai fighters? Thanks! I haven’t been able to find any epidemiological studies on Thai fighters (certainly not in English language). As I mentioned in my blog post, I also think it would be extremely problematic obtaining reliable data on brain injury associated with Muay Thai fighting because of the many other factors that influence brain function. In Muay Thai it is very often comes to injuries in the brain, although nowdays, the rules are more ristrict than at the beginning of this sport, but you may still use the elbows for breaking the head like opening a cockonut when you realy have a good chance to hit with the elbows. As a 20 year old knowing little about neuroscience and planning on taking up Muay Thai, I kinda wonder if one’s starting age has any effect on the brain injury risk potential. Could a younger practitioner’s brain adapt more easily and learn to recover from the damage, or is it just more vulnerable, making it a safer choise to start late? Hi, so I have a problem with concussion symptoms. The first time I felt them was last year in April. They went away. I started training and sparring like usual. Didnt spar hard. Just did technical sparring. Had a fight in Fall 2013…I didnt get hit much but after the symptoms of concussion came back. I havent sparred hard since…until this week and got hit super hard in the head. Im feeling the symptoms again. This time around, I am not trying to cause added pressure to my head. Any advice? I never want to stop training and competing. What do you think about me just sparring technically and then competing 1-2 times a year depending on concussion symptoms? Thank you so much. I think while you still have the symptoms you should actually stop training completely. When you are sure you are symptom-free, return to training in gradual stages (i.e., initially just jogging and skipping, then gradually working up to bag work, and later more intense pad work or technique drills with any contact). I would certainly advise staying off the sparring for some time – though for how long I am not really equipped to say. I completely understand that you never want to stop training and competing – I’ve experienced these same feelings when affected by injury. But as for competing, you really need to see how it goes when you reintroduce training and, at a much later stage, sparring. Recurring concussion symptoms is definitely a concern. Have you consulted a specialist? do you think that a knee to the head the way it is usualy delivered to the styrnum witch can deliver nearly 2000 pounds of force can kill and if so witch aria of the head must be hit? Great blog, however, what about the damage you may be inflicting on your opponent? Yes, it is a great sport and a great form of exercise, but although you can fight without getting hurt, your main objective in a fight is hurting your opponent, which means that only the best fighters will fight and not aquire brain damage. On a brighter more positive note, I do understand that fighting is optional and you can receive the full benefits of the sport simply through training, while at the same time still being physically ready should you encounter a situation where you are forced to defend yourself. Thanks! Well people will forever debate on that issue and I appreciate that not everyone understands why a person would want to fight and put themselves at risk. But yes, fighting is totally optional and the sport has a lot of benefits with or without that aspect. My issue regarding concussion has to do with age. I am 53 and I love the sport and I love to spar. But If I get hit in the head with any amount of force. I get dizzy. I immediately stop sparring at that point. I spoke with my doctor. She says as you get older your brain is actually further from your skull which allows for more brain movement after a blow. Also, I played water polo for years in high school, college and after. I got hit in the head a lot with balls travelling 70 mph, elbows, etc… It never bothered me. I am wondering if all that abuse in my younger years is causing the problem I am having now. Anyone know anything about age and head trauma; even slight head trauma? I know that subconcussive blows can have cumulative effects so it would make sense that you are increasingly experiencing symptoms as you get older. As for what you can do about that other than stop sparring I am not sure. I’ve trained in martial arts for a long time as I love it, I started MT around 4 years ago, including sparring. I recently took a 6 month break from the sport while relocating to a new city for work and over the last few months I’ve started training at a new gym. Last week I had my first sparring session in around 18 months, where the instructor had us pair off with various fighters of various sizes and experience, he told them I hadn’t sparred in a while. Definitely took a number of head shots as my defensive game was way off, plus some people were throwing down too, looking back I should of got out of the ring back and gone back to pads, but pride / stubbornness made me stay. I remember feeling quite depressed and empty afterwards – which at the time I put down to loss of pride/ego due to a poor show on my part, now I’m not so sure, this may have been the first onset of concussion. My forehead hurt to the touch the day after too – I’ve never had this before and I’m well used to taking part in contact sport. I appreciate risk of injury is part of the deal, which is usually far outweighed by all the positives – high levels of fitness, a great way to burn off stress, learning challenging skills/techniques, meeting new people, becoming proficient in self-defence and confidence. This week I’ve been suffering with memory, focus, fatigue, problem solving, mental arithmetic and attention problems, plus feeling in a bit of a mental fog and it’s kind of got me a bit panicked / anxiety ridden – so much so that I went to A & E yesterday and they gave me a CT scan, which showed all clear. I rang the gym today and spoke to the trainer, explained things and he told me that apparently there is a bug going round the gym and he himself has been feeling out of sorts with the same symptoms I described. He told me not to worry and that he didn’t think it was concussion as most of the heavy shots were kicks to the legs. I’m unsure though (as I did get clocked in the head a few times – possible cumulative concussive impacts), plus as I’ve only trained there for a few months I feel I don’t know the trainer well enough to be confident in his assessment or whether he may be just playing it all down to avoid any possible repercussions. I’m not sick physically in my body, just my head feels like its in a bubble and I’m disconnected from things. I have a very technical, mentally demanding job and I’m new to the company, which makes it doubly hard to get rest if it is concussion, obviously I am concerned about the long-term implications of this too. When you went for the CT scan did you consult a doctor and explain your symptoms/activity? What did they say at the time? I can understand the trainer trying to put you at ease. In the end sparring was voluntary, and I imagine in most cases people come out of sparring sessions unscathed. Also, he’s a Muay Thai instructor, not a doctor, so I don’t think you should expect him to have the knowledge to give you an accurate assessment – you need a health expert for that. You mention that you have a demanding job and that you’re new to the company. Do you think it’s possible stress and anxiety from a combination of your new job and first sparring session in several months could be causing your symptoms? I don’t know you and am no expert but I think you should see a doctor again if you are still experiencing symptoms and concerned. I wish you the best. Hey! I loved your article! I am living in Thailand right now, on exchange. I’m sixteen, and have been training for about 2 months. The differences it has made for me are enourmous and I am planning to ramp up my training, 4-5 days a week, training runs about 3 hours a day. I have been going 2-3 days a week. I think that in maybe 4 or 5 months, I might want to compete in a fight. I am hopelessly incompetent as of yet, sparred yesterday and completely failed to block kicks and was thrown several times. But I am getting better, and am utterly in love with the sport. I wondered if you had any advice about first fights, but also, I will be heading home in June and I want to continue training, do you have any thoughts or experience on finding muy Thai instructors in the U.S.? let me say a few works about COBAN`S gym. Coban’s Muay Thai NYC Camp is the only training facility in New York City run by a 2-time Lumpinee Champion and 5-time Muay Thai Boxing world champion. all very true however the gym is not all that popular . this is a clear sign of marketing vs true righteousness and rightfull recognition. I only just found this impressive post. I was addicted to boxing. It was so long ago that we never had headguards. I’ve been unable to find any good evidence that they make the sport any safer and I’ve been that the Olympics are dropping the requirement for headguards, at least for some weight classes, I suspect that their adoption, in the 1980s, was one reason why boxing went into a decline for a decade or so. What people like about combat sports is the intensity of the 6 – 30 minutes of action, and anything that reduces that intensity is undesirable for may people. After all, if yu wanted to be safe you’d wear padding all over your body, not just a pair of shorts. And what would be the point of that? “People do contact sports because they are a bit dangerous, not despite the dangers. I was never professional, but we fought frequently from the age of 11 up to 37. I was KOed several times, but mostly fights were won by TKO or on points. The only really serious KO that I had was when I went over the handlebars of my bike, headfirst into a stone wall. I suspect that if I were starting now I’d try muay thai or MMA (they didn’t exist in the west when I was active), In muay thai, you don’t take a s many punches as in boxing. And in MMA, a lot of the punches are with your head on the ground, so acceleration effects are much reduced (also, you can’t get the same force behind a punch as you can when standing). Thanks David. Agree with your comments. Am thinking of writing a follow up to this post…when I get round to it! Great. I look forward to the follow-up. But getting problems with ‘faulty memory’ sounds dangerous to me. Although there’s is no clear relationship between blows to the head and dementia later, Alzheimer’s is such a frightful condition that it would be foolish to take a lot of punches/kicks to the head. As Melissa says, you don’t heal nearly as easily as you get older. When you’re 20 or 30 a punch in the face is something you can cope with and recover from pretty quickly. It’s all part of the challenge. Later you can’t do that. It really might be better to treat your training as exercise, rather than preparation for fighting. It can still push your limits. My solution was to take to marathon running, It’s not the same, I know, but it’s quite challenging enough.